Sunburst Shutters San Antonio gives you the most you could ever possibly ask for from a window shutter. And more! Plantation shutters in San Antonio are a great window treatment for your home because they’re excellently designed - both inside and out! Their strong louvers give your window a clean, contemporary look. And we manufacture our plantation shutters to give you energy efficiency and longevity so your stunning investment provides big savings and increases your home’s value. Plantation shutters are extremely versatile, as well. By simply tilting the louvers, plantation shutters open up the view and sunlight you want. Louvers are the horizontal panels that you can move to increase – or decrease – the light you let into the room. They can be adjusted using a mounted tilt rod. 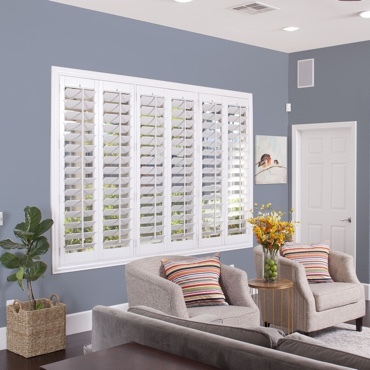 No matter what your specific needs are, from unique window shapes and color matching to frame customization, Sunburst Shutters San Antonio has the window shutters to work with your space. Where did the name plantation shutters come from? Plantation shutters are called that due to their regular usage in large estates and plantations, mostly in the American south, where they were popular for their classy looks as well as their potential to block heat from getting in. What kind of shutter do you recommend for my different rooms? Any space will have some particular needs. That's why we've assembled the Ultimate Room Window Treatment Guide to make it easier to decide on the perfect choice for each room in San Antonio houses. Where are plantation shutters made? Polywood plantation shutters are one of the only shutters that are 100% constructed and put together in the U.S.A. The different louver sizes of plantation shutters allow you the most unhampered view of your San Antonio neighborhood while adding beauty to your home. Plantation shutters give you the absolute light, temperature, and privacy, privacy, light, and temperature control of any window treatment. Differing louver sizes can also mean fewer louvers across your window. This gives plantation shutters their clean lines. A modern look and easy control of light and temperature make plantation shutters the favored choice of interior shutters in San Antonio. As a result of the way they’re put up on your window, plantation shutters become an enduring fixture. When your home is appraised for resale, plantation shutters add to its estimated market value. You get to appreciate your shutters while you live there now – and gain back your investment when you sell it later. It’s a win-win situation. We design plantation shutters that accent your window and your decor perfectly. That’s why we bring you these exceptional brands of custom plantation shutters. Crafted from an engineered wood substitute, Polywood® plantation shutters won’t chip, warp, crack, or split. On top of that, the color on our shutters will never yellow or fade. Our colors last because we bake on our premium paint finish and pair it with UV stabilizers that make the premium synthetic resilient to sunlight. So, no matter how long the San Antonio sun shines, your shutters will look as beautiful as the day they were first installed! Polywood plantation shutters are also the gold standard for insulating shutters, making your home more energy efficient than it ever was. Read about the Polywood Insulating System® to find out about the energy efficiency perks Polywood shutters can add to you. We custom build all of our Polywood shutters so they look beautiful on your San Antonio windows – and work without a hitch each time you open and shut them. If you need a premium wood plantation shutter, you have come to the right place. Ovation® hardwood shutters are crafted from solid teak so you know they are built to last. A five-star wood shutter, Ovation shutters are provided in different louver sizes that feature the durability of furniture-grade hardwood. Do you have a specific color set up to fit with your decor? Ovation plantation shutters are available in 28 different wood stains and 11 unique paints, so you're able to easily match your current window trim or complement the design of your space. We manufacture all of our Ovation plantation shutters so they fit your San Antonio windows perfectly and work smoothly. Add a contemporary touch to your house with reclaimed wood shutters. Each individual shutter louver has its own specific color and finish, made by Mother Nature. We custom build these shutters to match any window in your home. 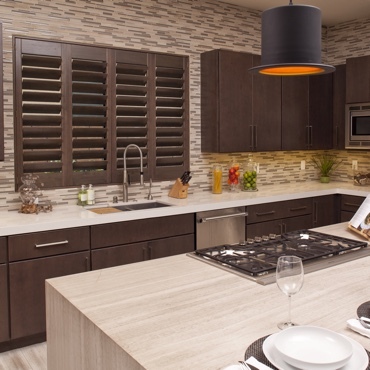 Studio shutters are the latest offering from Sunburst Shutters San Antonio. Uniquely engineered to offer both the stunning looks of plantation shutters and home value, Studio shutters are a smart, streamlined window treatment. Schedule a free in-home consultation today by calling 210-876-0377 or filling out the form below!